The 100 Arab start-ups were selected at the World Economic Forum on the Middle East and North Africa, held in Jordan, which started on Saturday. The announcement of the five-year visas was made during the participation of Abdulla bin Touq, secretary general of the UAE Cabinet, and Khalfan Juma Belhoul, CEO of Dubai Future Foundation. “The UAE is a global incubator for emerging innovations. Our innovation-friendly legislative structure is essential for start-up companies,” said bin Touq. “This collaboration with the World Economic Forum to grant long-term visas to the top 100 Arab start-ups reflects our commitment to facilitate businesses, create an attractive and encouraging environment for growth, and underline the UAE’s position as a global destination for talents,” he added. The start-ups will also have a chance to team up with Area 2071 in Dubai which serves as a gateway and a platform to design the future, through encouraging creativity, fostering talents as well as attracting local and global partnerships. According to the World Economic Forum, nearly 20% of the Arab world’s 100 most promising start-ups are based in the UAE. The World Economic Forum and the Bahrain Economic Development Board (EDB) selected the 100 most promising Arab start-ups of 2019. The initiative aims to further integrate the Arab world’s most promising start-up entrepreneurs into a national and regional dialogue on pressing challenges. Among the selected start-ups are the world’s first halal investment platform (Wahed, UAE); a biotech company that uses camel milk to develop antibodies (MonoJo, Jordan); a platform to meet fellow football players and book pitches (Malaem, Bahrain); a production company shaping its country’s cultural landscape (Akkasa, Oman); the first coding booth camps for the Arab world (Coded, Kuwait); and a company conducting a range of mapping including that of cultural heritage sites with autonomous drones (FalconViz, Saudi Arabia). The initiative also welcomed back start-ups selected in 2017, including Elves (Egypt), an AI concierge service; Daraty (Syria), a toolkit for children to learn electronics; and Careem (UAE), the Arab world’s first unicorn company recently sold for $3.1 billion. With a 31% increase in investments compared to 2017, a new record was reached for regional start-up funding last year, according to data from Magnitt. 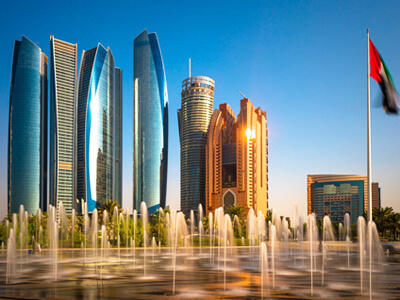 Foreign investment remained stable in 2018 with 30% from outside the Arab world, while fintech took over e-commerce as the top industry as a result of an 8% increase in deals since 2017. Khalid Al Rumaihi, chief executive of the EDB, said: “Across the Middle East, entrepreneurs are devising increasingly innovative ways to tackle the evolving societal challenges of the Fourth Industrial Revolution with novel applications of technology.